I found this scene playing off next to the tent when we were camping the other day. 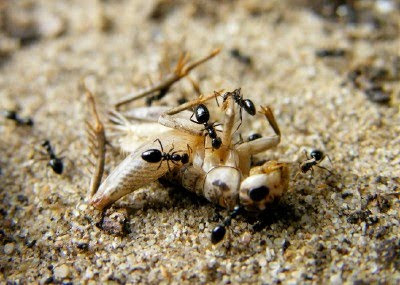 The ants were trying to move the dead little grasshopper without much luck. There just wasn't enough of them. 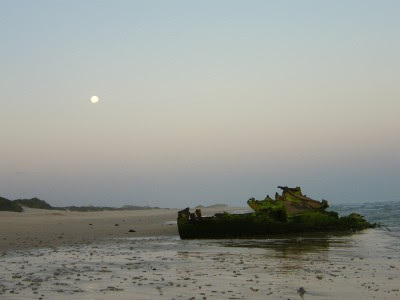 The blue moon (second full moon of the calender month) rising over the ship wreck at Cannon Rocks in the Eastern Cape on New Years Eve. For more fabulous pictures featuring the sky, visit Skywatch. 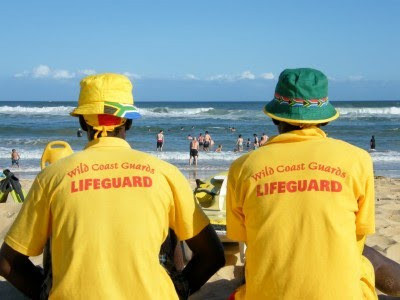 A couple of lifeguards watching the swimming area at the main beach in Cannon Rocks. 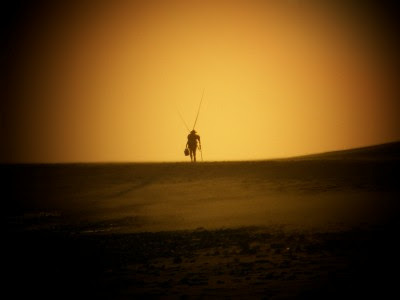 I popped down to the beach to get some sunset pictures and saw this lone fisherman walking along the shore with all his equipment. Probably on his way to his favorite fishing spot. By now you are probably getting a bit bored with all the Oudtshoorn and Klein Karoo posts, so I will move on to the second part of our holiday which was a week spent at Cannon Rocks on the coast. I have some more stuff from this area, but I'll keep it for a little bit later. 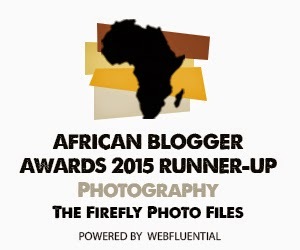 But before we get back to the coast, today's post is a bit more on the personal side. On our drive back from Oudtshoorn to the Eastern Cape, we stopped at my uncle's farm in the Langkloof. 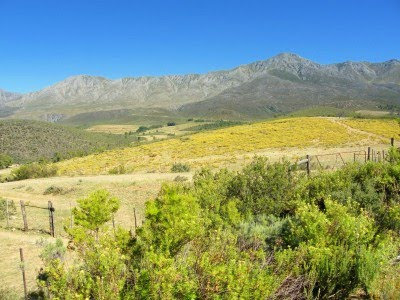 The Langkloof is farming area where they farm predomenantly with summer fruit like apples, peaches and apricots. My grandparents (on my mom's side) and great grandparents are all buried in the old family grave yard on the farm and I wanted to stop by and pay my respects as the last time I was there was with my grandmother's funeral a couple of years back. The reason I wanted to post this is to show you the view from the graves looking across the farm towards the mountains in the distance. With this kind of view its no wonder they wanted to be buried there? 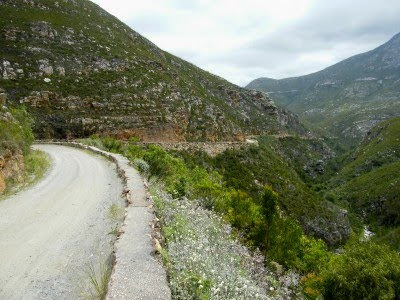 for our armies' might and main"
As you drive higher up the Montagu Pass, the road gets steeper and narrower. You can imagine how this could have been a problem during the early days of ox wagons. Two wagons could not pass abreast in most places, specially around the tight corners. Consequently the drivers and ox leaders had to whistle and shout and crack their whips continuously to warn one another of their approach. 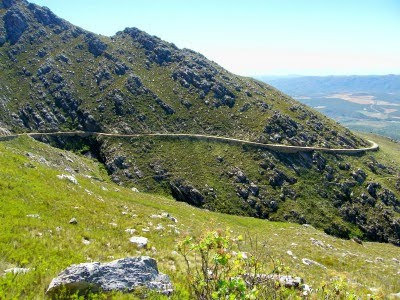 Very close to the top of the pass, the road passes under the railway line that crosses the Outeniqua Mountains. There is a spot on the railway line just past this bridge called topping which indicates the highest point of the line and the road. Looking back from this point you can see three of the four passes that cross the mountain. 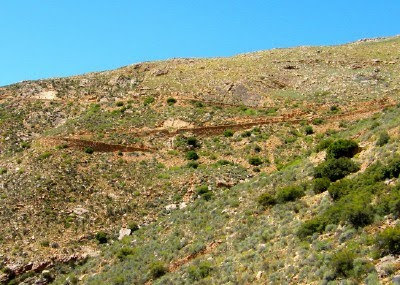 On the left hand side is the Montagu Pass and the railway line next to each other. If you look at the mountain in the background you would see a faint white line running along its side. That is the Outeniqua Pass, the main and quickest way to the other side. 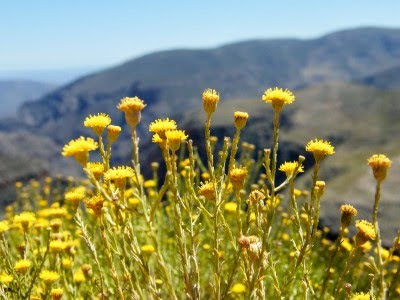 The fourth pass is the old Cradock Pass which is only acessable as a hiking trail today. 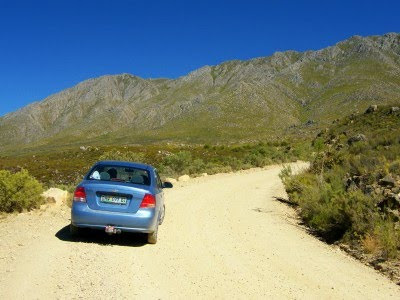 A week or two ago I posted on my trip over the Swartberg Pass (part 1 and part 2) during my recent holiday. I also had the opportunity to do another of the iconic Southern Cape passes while I was in the area. 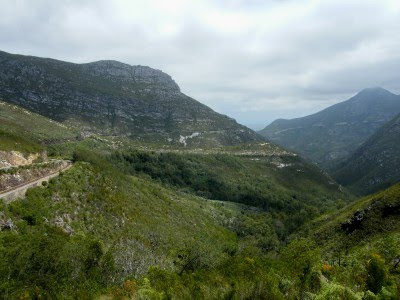 The Montagu Pass is the old pass over the Outeniqua Mountains from George on the coast to the Klein Karoo. The pass has been declared a National Monument which means that it is beautifully maintained and very enjoyable to cross. 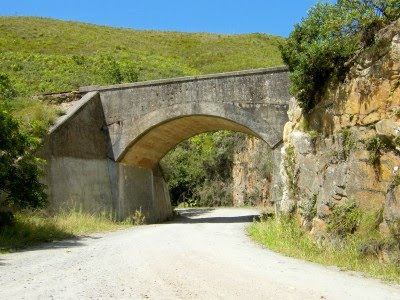 A suggestion was made in 1843 to build a good road over the Outeniqua Mountains to replace the very dangerous Cradock Pass which was nothing more than a track over the top of the mountain. Work started on the pass in 1844 and was done with convict labour. About 250 convicts were used in the construction and was housed in camps on either side of the mountain. The pass was officially opened in 1848 by Hon. John Montagu who was the Colonial Secretary and after whom the pass was named. Not long after you start to drive along the dirt road (and even though its a dirt road, its an absolute please to drive it in a sedan), one comes upon the Old Toll House. It has a fabulous view of the surrounding mountains and valleys and I would love to get my hands on the little building to turn it into a country getaway. Originally the toll to use the pass was one penny per wheel and one penny per ox. 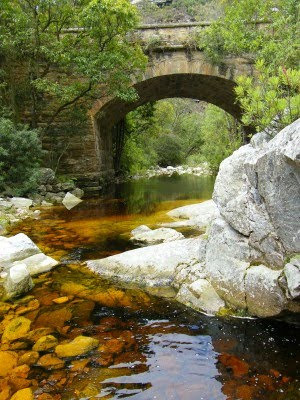 A short distance up the road from the Old Toll House you will come to Montagu Pass Bridge (also known as Keurrivier se Brug). I stopped just after crossing the bridge and climbed down to the river to get a pic of it. What an awesome spot. Ideal for a picnic and perhaps a quick dip on a hot day. I did find out afterwards that the vicinity of the bridge is supposed to be haunted by a man in a grey suit. I didn't see him though. Pity, I could perhaps have gotten a photo of a ghost. Imagine the amount of publicity I could get with that. Tomorrow in Part 2 we will travel up the narrow and steep part of the pass. Driving from the Garden Route to the Klein Karoo over the Outeniqua Pass, one passes a couple of farms growing plats that creep up strings hanging from wire frames. I used to wonder about it till I found out that it was hops. 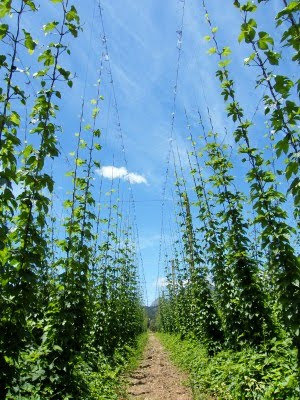 Now I don't know much about hops other than the fact that it is used primarily in the brewing of beer. So I went to the handy information tool that is Wikipedia. Hops are actually the female flower clusters, commonly called cones or strobiles, of the humulus plant. The hop plant is a vigorous climbing herbaceous perennial, and is trained to grow up strings in a field called a hopfield, hop garden or hop yard when grown commercially. 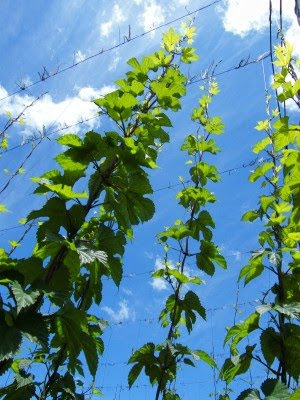 Male and female flowers of the hop plant develop on separate plants, but because viable seeds are undesirable for brewing beer, only female plants are grown in hopfields which prevents pollination. When we passed this field in December, the plants were still in the growing faze and there were no hops on to photograph yet. 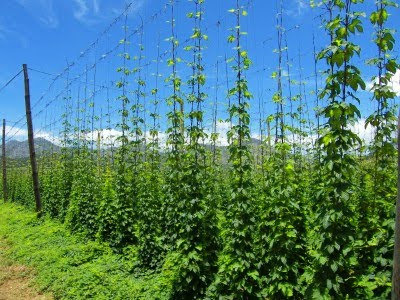 The hops in this area near George are only grown in a couple of valleys of the Outeniqua Mountains which must mean that the climate in these valleys must be ideal for hop growing but the surrounding area isn't. I have said so before I will say so again. I love small town museums. They are never pretencions and tells it as it is. If you want to know more about a town and its history, just look for it's museum and go and loose yourself in it. 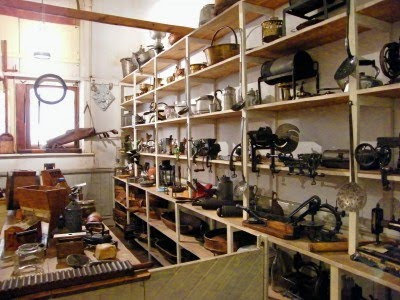 The CP Nel Museum in Oudtshoorn is one of these where one can go and be transported back in time. This beautiful sand stone building was opened in 1907 as the Boys High School. The building reflects a late Victorian Colonial style of a classical building. The tower is 30 meters high and is decorated with Corinthian ornaments. The oxtangoual "koepel" (dome) is rounded off with a wrought iron crown while on both sides of the central clock tower the facade is symmetrically designed. Both sides end with verandas bolstered by sandstone pillars in the Tuscany building style. CP Nel Museum is named after Charles Paul Nel. 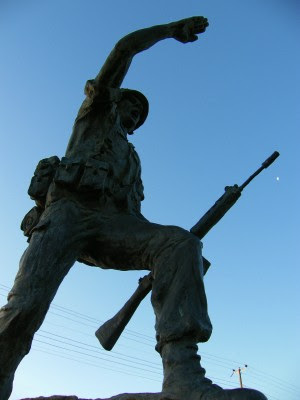 He was military man, businessman and collector of antiques. His collection was so valuable that it had received full recognition from the Historical Monument Commission in 1938. In 1963 when both Oudtshoorn boys' and girls' schools amalgamated, the school building was in such a state it was nearly demolished. But thanks to intervention by former old boys, the building was saved and CP Nel's collection, by then under the administration of a Board of Trustees, was moved there in 1972. The museum has a number of excellent exhibits. 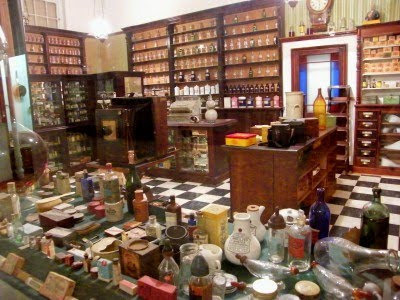 One of its best know exhibits is a fully kitted chemist as it would have looked like at the end of the 19th century. Another room is a fully stocked General Sales Store from about 1911 with everything it would have been selling. In addition to a number of other exhibits, another one that stands out is the only Synagogue to be situated in a museum. What makes the Synagogue so amazing is the fact that it's still being used on occasion. As our round trip day outing via the Swartberg Pass to Prince Albert and back through Meiringspoort was coming to an end, we made a quick stop in the town of De Rust. 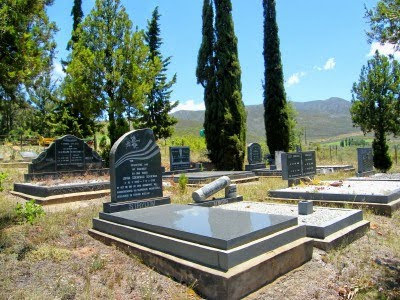 Named such as it was a place to outspan the oxen to rest before or after a journey through Meiringspoort, the town is quaint place with a couple of interesting shops and eateries along its main drag. 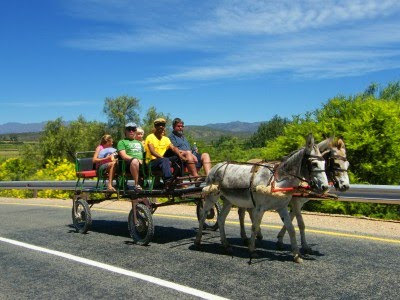 As we were coming into town I noticed a donkey car standing next to a sign saying Donkey Têksie. 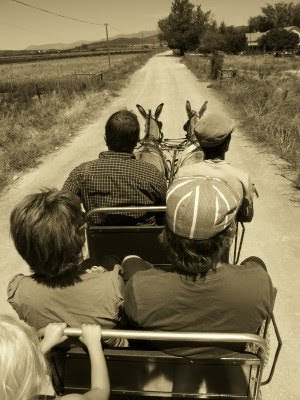 Although the Rugrats were tired and whining, they jumped at the opportunity to go on a donkey car trip down the road out of town and back. I was surprised at how well the custom made cart was constructed with comfortable seats and a suspension system so that tourists and visitors can have a enjoyable and not a bumpy ride. Afterwards the Rugrats were still very excited and couldn't wait to phone the grannies and tell them what they had done. Up to then they had been extremely bored with nothing but (spectacular) scenery to keep them busy, but this made their day. 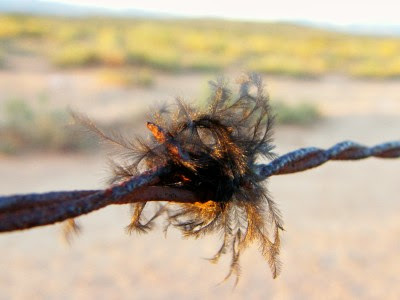 The world's biggest bird walking down a fence in the Klein Karoo near the town of Oudtshoorn at sunset. For more awe inspiring pictures from all over the globe featuring the sky, visit Skywatch. 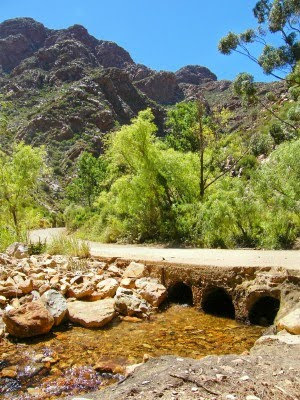 There are two ways to get from the Karoo into the Klein Karoo over / through the Swartberg and both are very scenic. 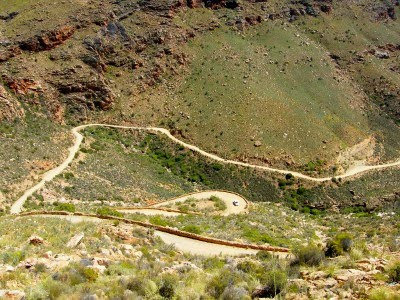 The Swartberg Pass is for those with lots of time and Meiringspoort for those in a hurry. 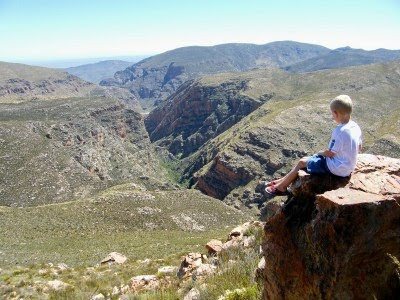 The Meiringspoort road features soaring cliff walls with spectacular rock formations along the 25 km tarred road which winds along the floor of the gorge and crosses the Groot River 25 times. Each crossing, or drift, has its own name and story. Its not easy being the driver with such magnificent scenery around as one tends to look up and about when traveling this way. 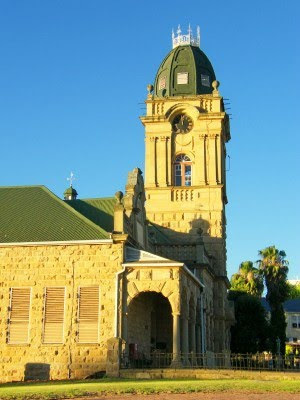 The first road through the poort was constructed between 1856 and 1858. In the early days the road was amongst others used to transport wool from the interior to the coast with 12 long ox-drawn wool wagons. 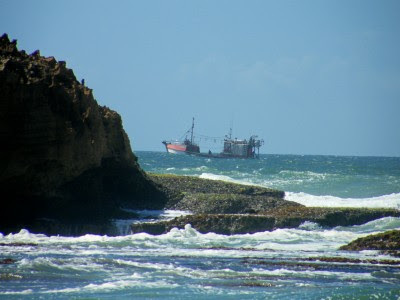 Today is used mainly by people (and goods) traveling to the Southern Cape coastal area. There are a couple of places where one can stop. The most popular one is the Waterfall information site. Here visitors will find one of the most scenic spots in the kloof. 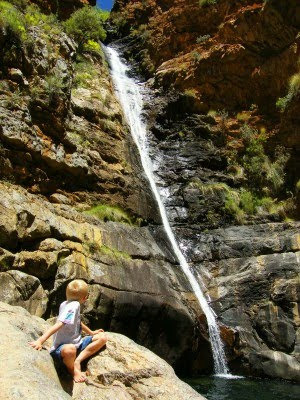 The Skelm has a waterfall tumbling into a dark pool which, legend has it, is bottomless. (In 1938 it stopped flowing for the first time in human memory). On the day we drove through the poort the temperature was in the upper 30's Celcius and a lot of the people who stopped were cooling down in the pool and streams running from it. Legend has it that a beautiful mermaid lives in the pool at the foot of the waterfall. During the 1996 floods a story circulated that she had been washed out of the pool, down the Groot and Oliphants rivers and out to sea where she was caught in a fisherman's net and taken to the CP Nel Museum in Oudtshoorn. 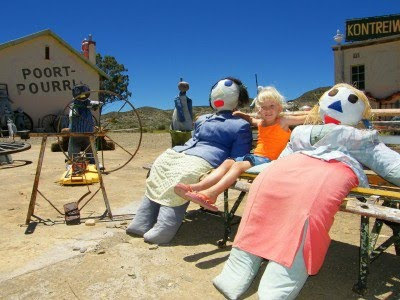 Follow this link for more info on Mermaids in the Karoo. Driving towards De Rust and Oudtshoorn from Prince Albert takes one through Meiringspoort. Just before you enter the poort the road passes the little hamlet of Klaarstroom which has remained virtually unchanged since the days of Queen Victoria. As we were passing the turnoff into Klaarstroom my eye caught a peculiar sight and I nearly left the road as I spun my head around. A number of man sized dolls were sitting on benches, on bikes and just standing around next to the road. 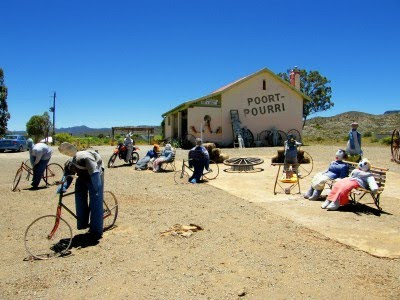 It turned out to be a gimmic to get people to stop at the Poort-Pourri Kontreiwinkel (country or farm stall). 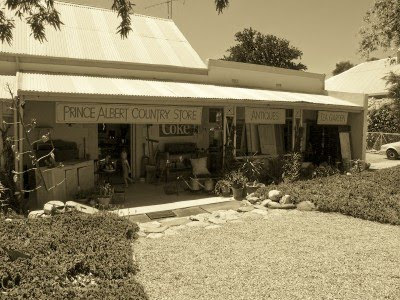 The shop sells antiques, bric & brac, fruit end veg and of cause cold drinks which was very welcome on a day the temperature topped 40C. I asked Drama Princess to sit in between two of the "ladies" to get a good idea of their size. At first she didn't trust them thinking that one may just move, but eventually sat down and posed for a pic. The village is an absolute gem. 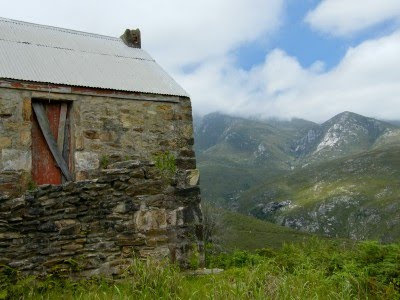 Its just about surrounded by the Swartberg mountains and has seen a bit of a revival over the last few years. Its the type of place where city slickers go to flee the rat race and open a B'n'B, restaurant or start producing olives and cheese. The area is well known for its dried fruits, specially figs and apricots. 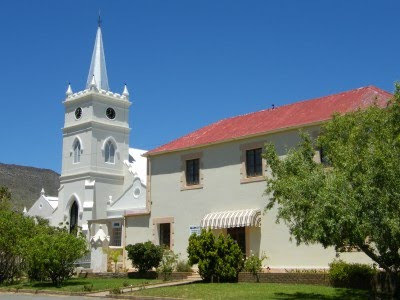 As you drive into town, the imposing Dutch Reformed Church (completed in 1844) looms on the left hand side. 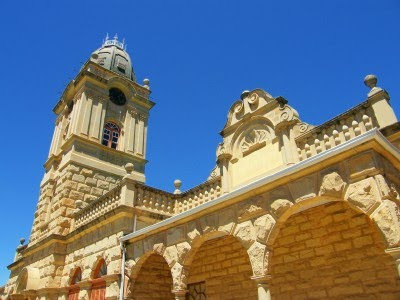 The town has some beautiful Cape Dutch, Karoo and Victorian buildings with 13 of them being National Monuments. All around town one marvels at all the historic buildings and how well they are maintained. 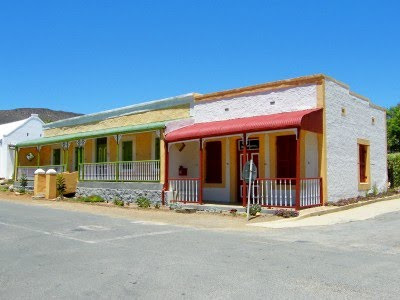 These houses are typical Karoo architecture. Although the town is situated in the arid Karoo, its a very fertile are and gets its water directly out of the Swartberg mountains. I was amazed at the fact that the town still has working (what we would call in Afrikaans) leivore. 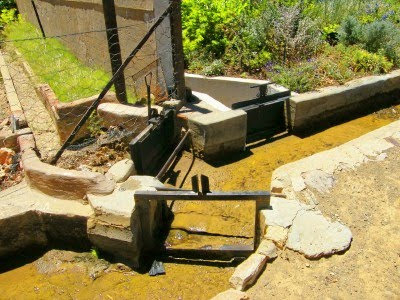 They are small channels that are used to run water through a town. If you needed to water into your garden or fill up your tank, you would open your little "channel gate" and it would flow in. Such a system would work purely on gravity with water flowing downhill all the way. Some of the old towns like Stellenbosch near Cape Town still has working systems like this one as well. 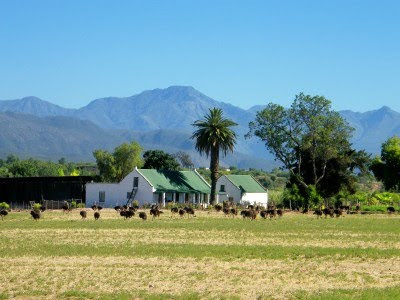 A farm house on one of the ostrich farms just outside Oudtshoorn on the road to Schoemanshoek. The mountain in the background is the Swartberg where the Swartberg Pass (read here and here) can be found. Yesterday we drove up the Swartberg Pass and took a break at the top. Today we decent into the Karoo. 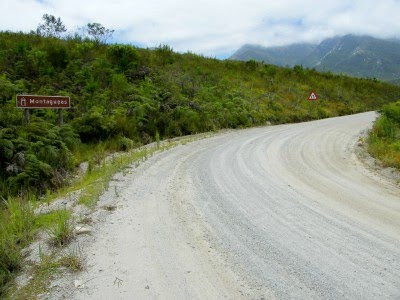 The northern part of the pass is famous for its switchbacks and you won't find a travel book on South Africa that doesn't have at least one photo of the pass. Just before we started our decent I was curious to see where we were going and saw how the road snaked down the mountain side at a gradual decline. There was a couple of vehicles coming up the pass from the Prince Albert side and I waited to get some pass pics with vehicles in it. After a short distance there was a spot to pull over and everybody stood on the edge looking down. We stopped and hopped out to see what they were looking for. 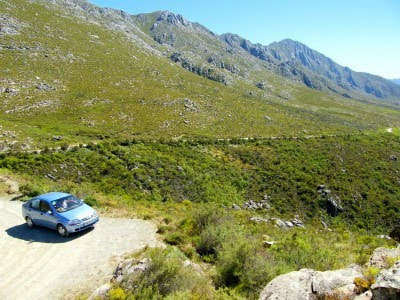 What was waiting below was probably the most spectacular part of the Swartberg Pass. The road was turning back on itself a couple of times and it was incredibly steep down to the bottom. I couldn't wait to get behind the wheel and make my way down it. As soon as we hit the bottom of the steep section I stopped and got out to get a shot of the view back to the top. You couldn't see the actual road, but you could see the retaining stone walls that were built in the 1800's. AWESOME! Rights at the bottom of the pass just before you join up with the tar road going to Prince Albert there is a valley with a welcoming cool stream and shady trees. We stopped next to the river and couldn't get our shoes off quickly enough to get our feet into the soothing water. A perfect end to a perfect drive. One of the highlights (literally and figuratively) of the holiday was getting to drive over the Swartberg Pass outside Oudtshoorn. The pass links the Klein Karoo with the Great Karoo and its always been very high on my "to do" list. 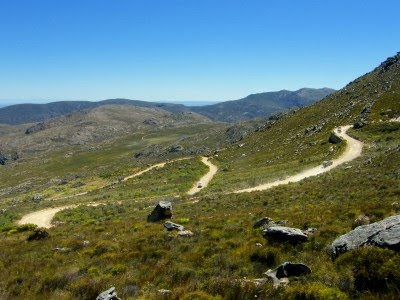 The Swartberg Pass was built by one of South Africa's great pass builders, Thomas Bain, between 1881 and 1883. The construction work was done by convict labourers and the pass was officially opened on 10 January 1888. The pass is 24 km (feels much longer) long and is 1585 meters above sea level at its highest point. The beauty of it is that it's still a dirt road pass and most people using it goes to enjoy the scenery which means the going is nice and slow. You leave Oudtshoorn on the Cango Caves road. About 30km from town you turn off and after another stretch of tar the road becomes gravel and the fun starts. Even though its gravel, the road is more than good enough for a sedan and as you can see I drove it in my Chev Aveo. Driving up the southern side of the pass is actually the easy part of it. The road isn't too steep and its mostly a gradual climb to the top. All along the way there are spots to pull over and enjoy the view. 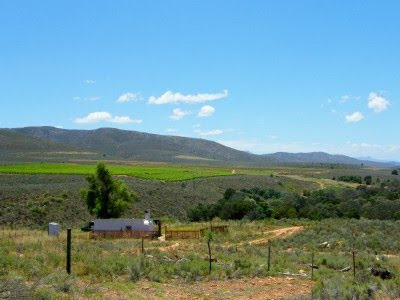 The Klein Karoo side of the Swartberg is mostly farming area and although its a very dry part of the country, it seems that the valleys are very fertile judging by the amount of farming taking place in them. At the top (1585 meters) we pulled over for a breather and to enjoy the view towards the north. We didn't spent to much time outside though as the forcasted temperature for the day was 41C. 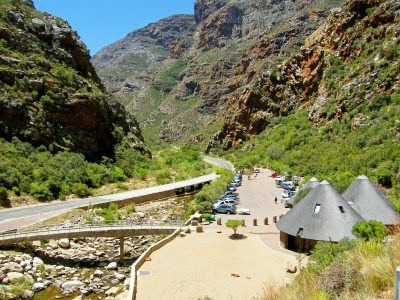 Part 2 of the Swartberg Pass tomorrow. There is an Afrikaans song that says "Oudtshoorn is 'n groot voël paradys..." (translates to Oudtshoorn is a big bird paradise). And that is so true. 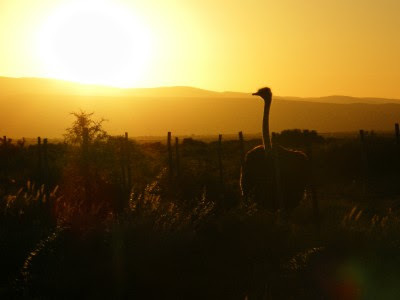 Oudtshoorn is called the ostrich capital of the world as 95% of the world's captive ostriches are found around the town. 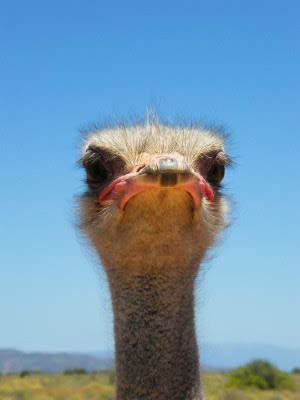 In the early days ostriches were farmed purely for their feathers, but today every single piece of the bird gets used. They are farmed primarily for their skin which produces the world's second strongest leather after crocodile. Feathers get harvested off the birds and a total of 23 tons are shipped to Brazil every year for the Rio carnival while ostrich meat (red meat I'll let you know) is now in demand the world over due to their low level of cholesterol. Ostrich fillet steak made to perfection cannot be beaten. 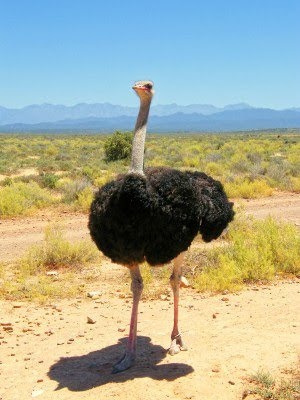 Tourism plays a major role in the tourism industry with at least three ostrich show farms in operation around the town. 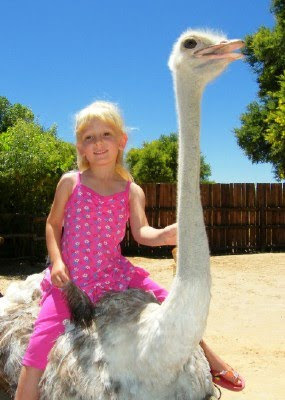 Highgate Ostrich Farm alone had more than 100 000 visitors last year through their gates. A visit to an ostrich show farm normally starts with an explanation of ostriches, where they come from and what is done with them. You get shown all their different feathers and what is used for. From there visitors get taken to the ostrich pens. Here you can hold a egg and even stand on it (it can hold 120kg) if you want to. 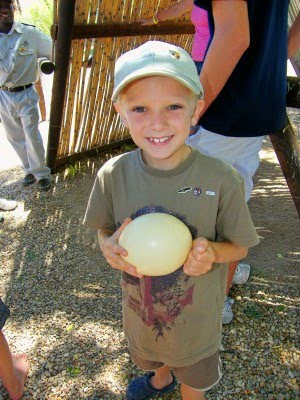 An ostrich egg is the equivalent of 24 chicken eggs and can take about 1.5 hours to hard boil. Also, the egg, unlike the meat, is very high in cholesterol. ... while the brave (as long as they weigh less than 75kg) can ride under the watchful eye of the professional ostrich jockeys. At the end of the tour the jockeys (imagine being able to put on your cv that you are a professional ostrich jockey) will do a race. 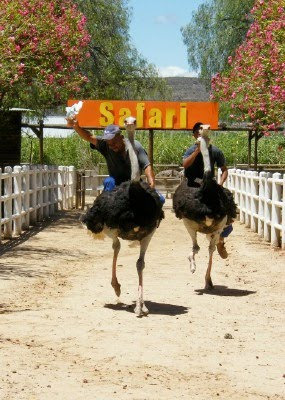 Here Hopeless (left) and Michael Schumacher (right) are taking part in a race at Safari Ostrich Farm. We spent the first week of our holiday in the Oudtshoorn area. 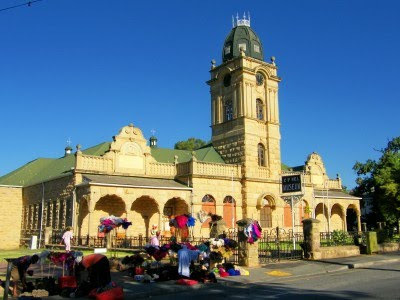 Oudtshoorn is situated in the Klein Karoo and its economy is basically split between farming and tourism. The word Klein means small or little in Afrikaans (also in Dutch) and Karoo is a Khoisan word that means Place of Thirst. 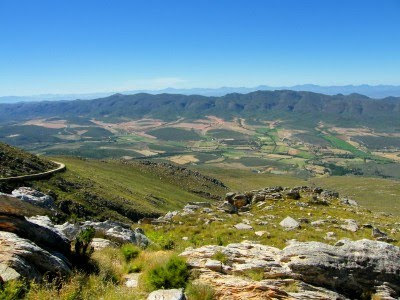 The Klein Karoo is flanked by the magnificent Outeniqua (the word means Men laiden with honey in the Khoisan language) Mountains to the south and the majestic Swartberg (Black Mountains in Afrikaans) to the north (above). Both these mountain ranges have well known historic passes crossing them. I drove both the Swartberg Pass and the Montagu Pass for the first time and wasn't disappointed. Also took lots of pics of both. Actually took lots of pics of all the places we visited. ... while it is also known as the ostrich capital of the world. Thus lots of ostrich pics. Ostriches close up, from afar, in large groups, on their own, at sunset, big ones, little ones... More tomorrow.